As those final moments of ‘The Force Awakens‘ come to a close and we see Rey (Daisy Ridley) hold out her hand with the iconic lightsaber to an older Luke Skywalker (Mark Hamill), we were forced to wait two years to see what happens next. The time is here now though with ‘The Last Jedi‘, which is the ultimate ‘Star Wars‘ movie and perhaps the most shocking ‘Star Wars‘ movie to date. I don’t know how many countless hours I’ve spent over the past two years, talking with my friends on possibly scenarios and theories on where these characters and story would take us. Needless to say, after all of the talk and hypothesizing, I was still way off, where Disney and director Rian Johnson (Looper, Brick, Breaking Bad) brought back that magic, emotion, and surprise that we first witnessed back with the original films. 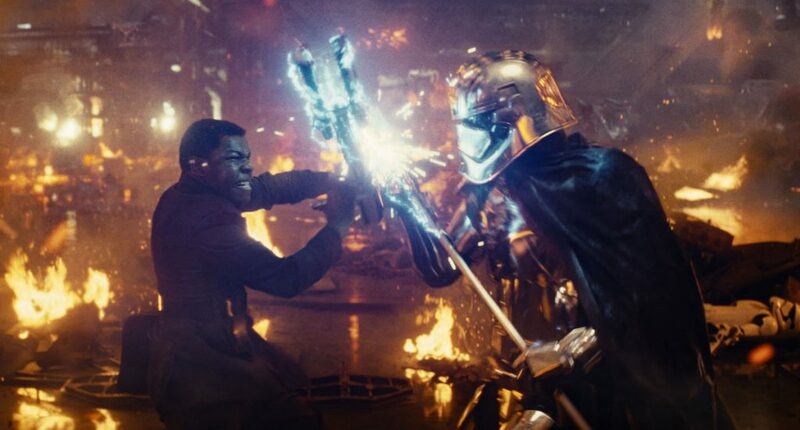 ‘The Last Jedi‘ picks up right where ‘The Force Awakens‘ leaves off with Snoke and Kylo Ren still wreaking havoc, as Rey is meeting Luke Skywalker and Finn (John Boyega) is recovering from his injuries. It doesn’t take too long to set the new story in motion with fights on land and in space. Johnson combines some excellent humor throughout the story too, which makes the film a lot of fun, all while being very serious. It’s a much needed sense of comedy that never feels too silly or over-the-top. In fact, it’s just perfect in how it’s executed. There are many different storylines that come together here that are never forced on us, but rather play out naturally. The dialogue and script is top notch, which touches on all the emotions. I found myself laughing out loud in addition to tears rolling down my face. What’s great about ‘The Last Jedi‘ is that you really never know what path it’s going to take. You think it’s going on way, then it completely surprises you and leaves you excited for what’s to come. It’s something that feels totally familiar, and yet at the same time, something fresh and new. Everyone turns a solid performance here too, but the spotlight is definitely on Mark Hamill and Carrie Fisher. Both have just grown into their roles over the past several decades, and they just own it. I can’t tell you how great it was to see Hamill play Luke Skywalker again. He plays it with such heart, wit, and expression that you can tell he’s been through some very dark times, yet he still has hope. It’s truly fantastic. John Williams‘ new score combines the vintage ‘Star Wars‘ themes with some brand new ones and is highly memorable and adds to the tonality of each scene. I don’t want to dive into spoilers at all, but just know this is again, in my humble opinion – the ultimate ‘Star Wars‘ movie, that had me on the edge of my seat, shedding tears, laughing out loud, shocking me at every turn, and excited for what’s to come. The Video: ‘Star Wars: The Last Jedi‘ comes with a 1080p HD transfer and is presented in 2.39:1 aspect ratio. This presentation on Blu-ray looks exquisite in every aspect. The image has a great clean look while having that nostalgic filmic aspect to it as well. Colors are bright, sharp, and extremely bold. The bright red lighting from the New Order ships give off a menacing red glow that brightens the screen up. The radiant orange on the fighter pilot suits as well as the shiny gold metal on C-3PO’s body looks amazing. The green pastures and grey rocks on Skywalker’s isolated island are beautiful and deep while the vastness of space and rich and inky black levels. The colors here are outstanding on the Blu-ray. Detail is very sharp and vivid too. Facial features, such as facial pores, stubble, scars, makeup blemishes, and wrinkles show up easily. The CGI work on Snoke is greatly detailed with every wound, wrinkle and age spot showing up easily. The scuff marks and dirt on the droids are easily seen as well while the wider shots always look sharp and never soft. Skin tones are natural throughout. There are no issues with any banding, aliasing, or video noise of any kind, leaving this video presentation with great marks. The Audio: This release comes with a lossless DTS-HD MA 7.1 mix and NOT the Dolby Atmos track that is included on the 4K UHD release. Still, this 7.1 doesn’t mess around and is quite the demo worthy track. Sound effects are nuanced in each space battle, action sequence, and even the quieter moments. Explosions, laser blasts, and ship sounds are all robust and dynamic in every way possible with excellent directionality. You’ll feel fully immersed in the action sequences with tons of sound effects going off in all directions. On the isolated island with Skywalker, you’ll hear the rain storms, animal life, while Rey is practicing using the force. Speaking of the force, that low rumble of bass is heard and is perfectly set to rattle your bones. That low end is phenomenal for sure. Other ambient noises are quite loud and often pour from the rear speakers. The score of course by John Williams is magnificent and adds that magic and mojo to every single scene. The dialogue is always clear and easy to follow along with and free of any pops, cracks, and hiss. This is a demo worthy audio track, even though the Dolby Atmos track is not included. 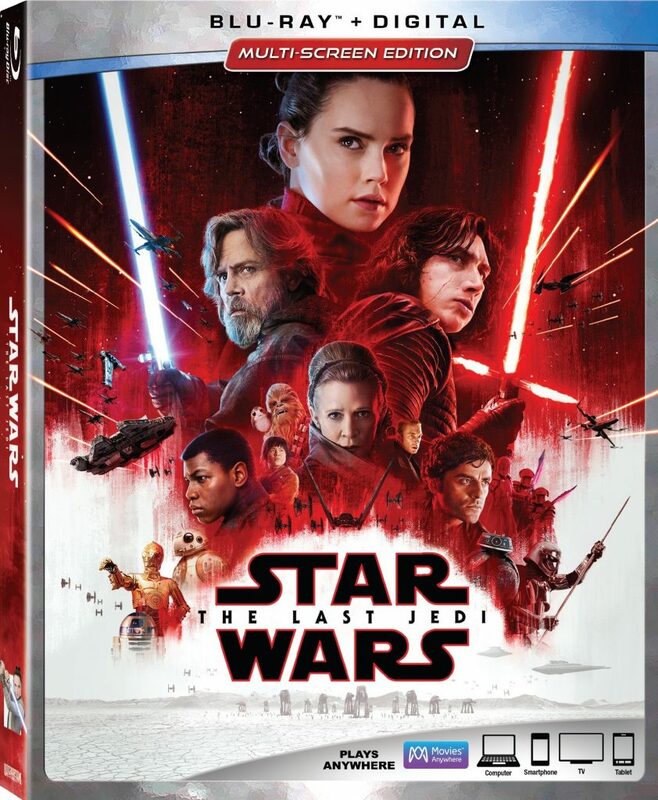 Audio Commentary – Filmmaker Rian Johnson delivers a fun commentary track as he tries to dive into a ton of information in relation to the story, characters, and his vision for the film. He talks about the score, the alternate opening, all of the different versions of the film, his reasons for his story, and more. It’s a great commentary track. The Director and the Jedi (HD, 96 Mins.) – A feature length documentary on the making of the film with interviews from virtually all the cast and crew as Rian Johnson gives his thoughts on every aspect of the film. There is a ton of on-set footage, behind the scenes, rehearsals, building of the major sets and props, editing, the visual effects, and more. This is a must-watch. Balance of the Force (HD, 10 Mins.) – A lot of this material is discussed in the audio commentary with Rian Johnson, but here it’s the only focus as Johnson talks about the mythology of the force and how each character uses it and why. Scene Breakdowns (HD, 33 Mins.) – There are three big action scenes that are discussed in detail here, which shows how they made each scene from pre-production to the final product. Andy Serkis Live! (HD, 6 Mins.) – A very cool look at Serkis performing as Snoke in the motion capture outfit. Someone get this man an Oscar please. This is raw footage and is quite amazing. Deleted Scenes (HD, 23 Mins.) – There is a mix of deleted scenes, an alternate opening, and some extended sequences here. All are worth your time and add to the story. Each scene comes with a director introduction as well as an overall intro from Johnson himself to start it all off. ‘Star Wars: The Last Jedi‘ is a fantastic film with a new direction from a brilliant filmmaker in Rian Johnson. The story he tells is necessary and quite intriguing while paying tribute to all of our favorite aspects of the original movies. I can’t enough of this movie as it has easily moved into one of my favorite ‘Star Wars‘ films of all time. It’ll be difficult to top this one. The video in 1080p HD is phenomenal in every way and despite the exclusion of a Dolby Atmos track on this Blu-ray version, it’s still top quality for 7.1. The bonus features are magnificent and worth your time. In fact, they are a must-watch. This is a MUST-OWN release. This entry was posted on Sunday, March 25th, 2018 at 5:44 pm	and is filed under Film, News. You can follow any responses to this entry through the RSS 2.0 feed. You can skip to the end and leave a response. Pinging is currently not allowed. « Favorite Movie Scene of the Day #18!